Last Game: Tuesday in Utica, the Penguins won 4-3 in overtime. Carter Rowney scored the overtime game winning goal for the Penguins. 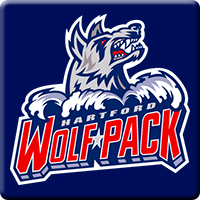 For Hartford, the Wolf Pack were shutout by the Albany Devils by a score of 3-0 last Saturday in New York. Last Meeting: January 27 in Wilkes-Barre, the Pens lost 3-1. Magnus Hellberg stopped 27 of 28 shots; Jayson Megna had a goal and an assist. Niclas Andersen scored the only goal for the Penguins. Why you should care: Penguins looked good Tuesday in Utica then for whatever reason the 3-0 lead that they had evaporated. That was probably a sticking point in practice this week. Look for the Pens to, if they get the lead, that they keep the lead. Other Game to Watch: Hershey and Providence are the two hottest teams in the division and they are set to do battle tonight in Rhode Island.